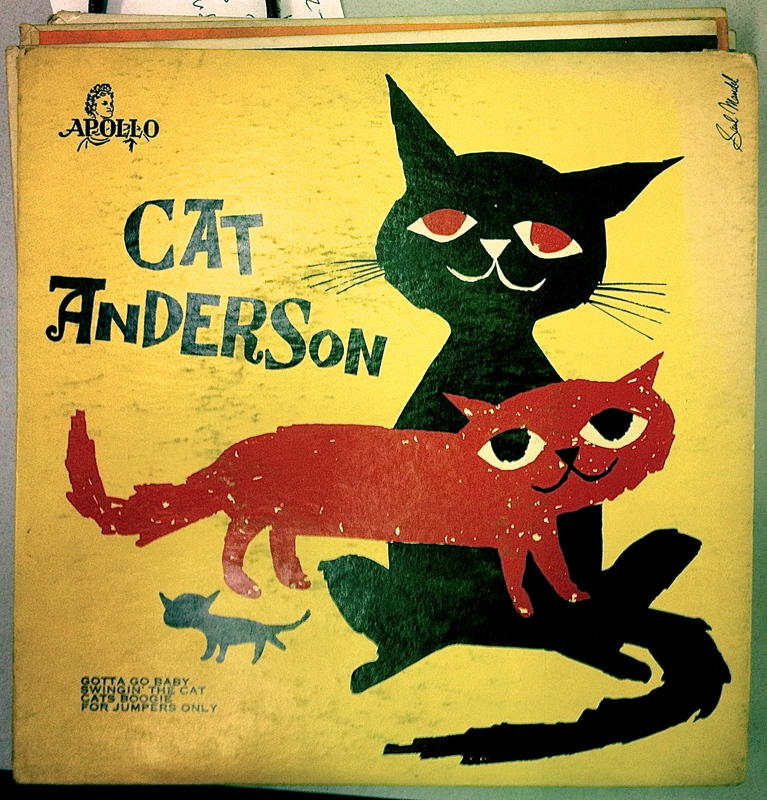 78: “Gotta Go Baby” b/w “Swingin’ The Cat,” “Cats Boogie” and “For Jumpers Only” by Cat Anderson. Apollo 771. Recorded in New York City, May 14, 1947. William Alonzo Anderson was born in 1916 in Greenville, South Carolina. The tragic death of his parents saw him moved to a Charleston orphanage at the age of four. While growing up there, he learned to play the trumpet and picked up his nickname of “Cat,” which was given to him by friends because of his fighting style. He played with a number of smaller groups throughout the Thirties and early Forties, eventually landing a spot in Lionel Hampton’s band. But his career really began in 1944, when he joined Duke Ellington’s orchestra. Ellington—who was unusually willing to share the spotlight with his sidemen—saw a lot of potential in this young man with a five octave range and delighted in writing songs that showed off Anderson’s ability to play higher than anyone else could. In 1944, Benny Goodman’s or Glenn Miller’s Orchestras might have sold more tickets, but Ellington’s band was the place to be if you wanted to musically shine. So it might seem surprising that Cat left the band in 1947 to pursue his own interests. We’re lucky he did, because “Gotta Go Baby,” the one song I was able to find from this EP, swings hard and well. Check it out. 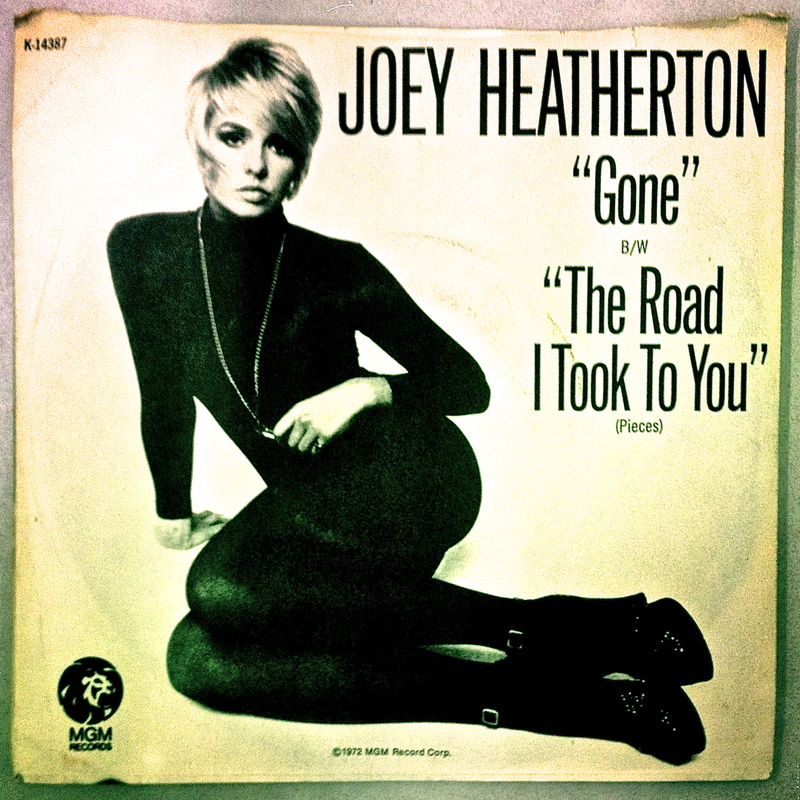 45: “Gone” b/w “The Road I Took To You (Pieces)” by Joey Heatherton. MGM K-14387. Recorded in 1972. Born in 1944 to life-long entertainer Ray Heatherton, Joey Heatherton got her big break as a stand-in and chorus member in the original 1959 Broadway production of “The Sound of Music.” A recurring role on The Perry Como Show soon followed, which lead to guest star roles in such TV shows as Route 66, The Virginian, and I Spy. She also had some roles in films like Twilight of Honor, (1963) Where Love Has Gone (1964) and My Blood Runs Cold (1965). That same year she performed “I’ve Got Your Number” on Dean Martin’s show. 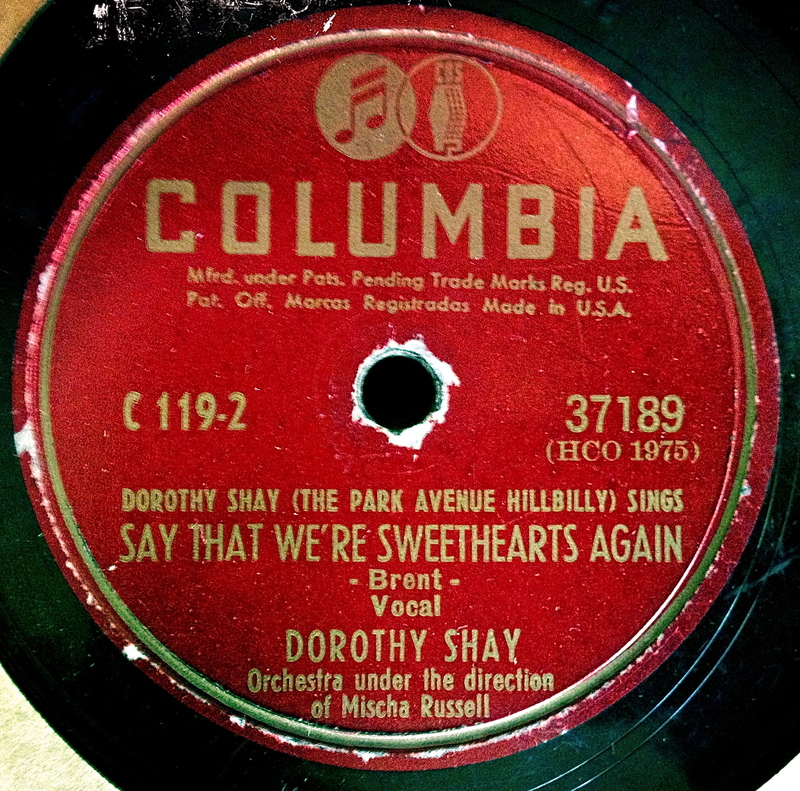 78: “Say That We’re Sweethearts Again” b/w “Feudin’ and Fightin’” by Dorothy Shay. Columbia 37189. Recorded in New York City, 1947. This week’s 78 comes from a brief detour from the Archive. I was recently visiting with my wife’s family in southern California, and her parents were kind enough to let me dig through a big, heavy (shellac weighs a lot more than vinyl) box of 78’s. Some of the treasures found within were by Dorothy Shay. 45: “So Much In Love” b/w “Roscoe James McClain” by the Tymes. Parkway P-871. Recorded in Philadelphia, 1963. 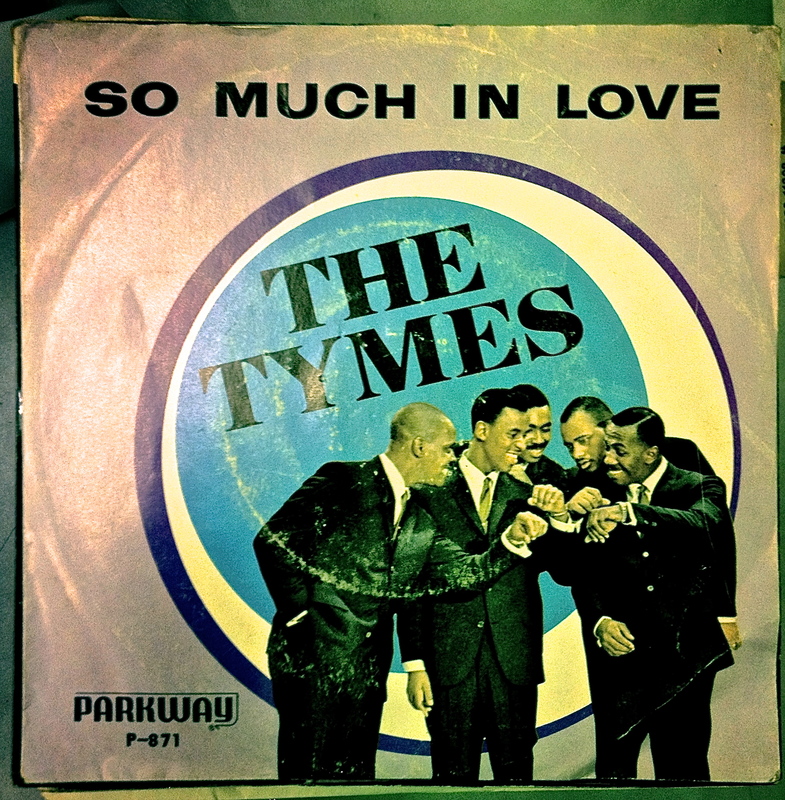 The Tymes were a Philadelphia doo wop group that formed in 1960. They were stuck playing local clubs for a few years, until they were signed to Parkway in 1963; a strong showing in a talent contest sponsored by local radio station WDAS had gotten the label’s attention. Their smooth vocal harmonies and lead singer George Williams’ mellow baritone came together in the studio to create “So in Love,” their only #1 song in the US. 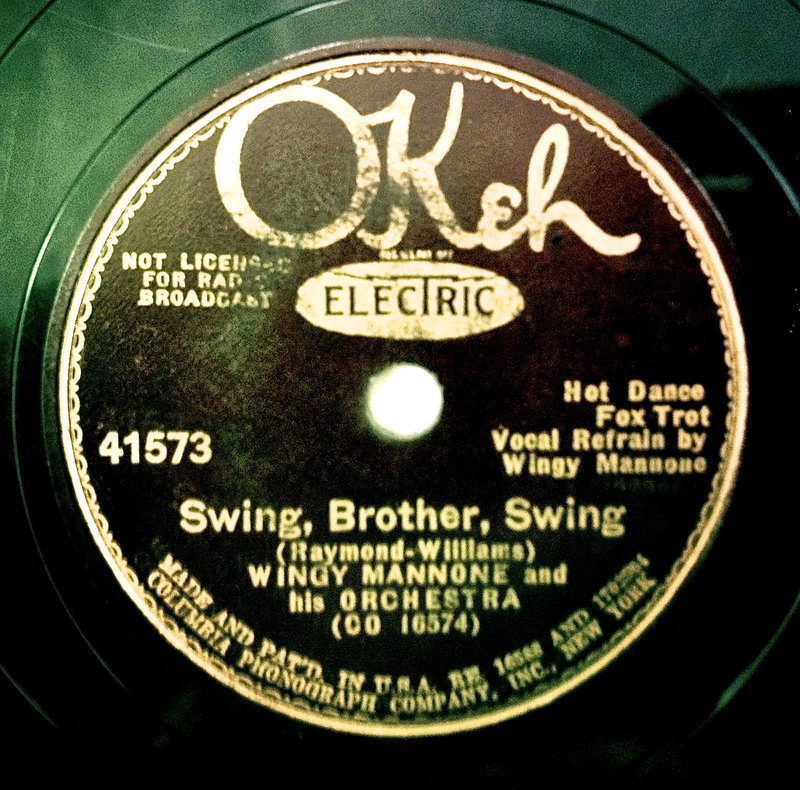 78: “Swing, Brother Swing” b/w “Nickel In the Slot” by Wingy Mannone and his Orchestra. Okeh 41573. Recorded in New York City, January 15, 1935. The problem with that theory: Louis was born in 1910. Wingy was born in 1900. So was it really Louis imitating Wingy? Not necessarily. The two horn players both took their similar (and enviable) musical upbringings and parlayed them into lifelong, highly respectable careers. Wingy gets points, though, for overcoming adversity. A streetcar accident took his right arm when Manone (or Mannone, at that point in his life) was only 10 years old. He’d been playing cornet for a few years, but still managed to re-learn the instrument with his left hand, using his prosthetic right hand to hold the instrument. From the cheap seats, no one could see the difference. You certainly couldn’t hear it. Here’s Wingy playing with the Arcadian Serenaders in 1924. 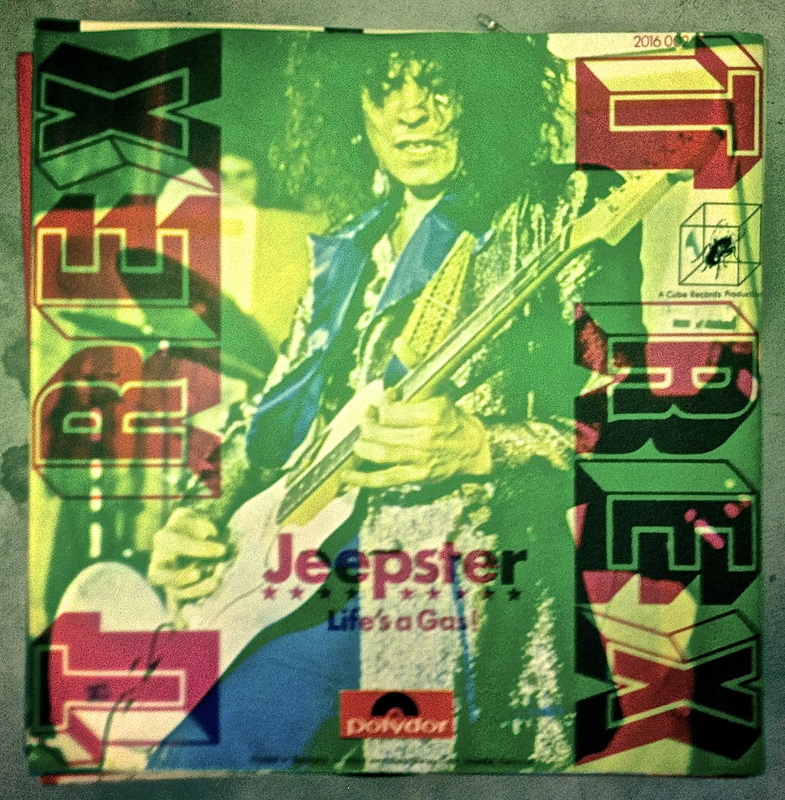 45: “Jeepster” b/w “Life’s A Gas!” by T Rex. Polydor 2016 002. 1978 German Re-release. Originally recorded in England, 1971. T Rex, logically enough, started out as Tyrannosaurus Rex, an acoustic act fronted by Marc Bolan that started in 1967. They released four albums of increasingly accomplished progressive folk music. The title song from 1970’s A Beard of Stars give s a good sense of where the group was coming from. Producer Tony Visconti used to write “T Rex” on track sheets in the recording studio because he couldn’t be bothered to write the band’s entire name, much to Bolan’s chagrin. But when Bolan put his pastoral meanderings behind him to write more riff-based, electric songs, he saw the wisdom of the smaller name and embraced it. Likewise, the album titles changed from 1968’s My People Were Fair and Had Sky In Their Hair…But Now They’re Content to Wear Stars on Their Brows to 1971’s Electric Warrior, from which “Jeepster” was taken. 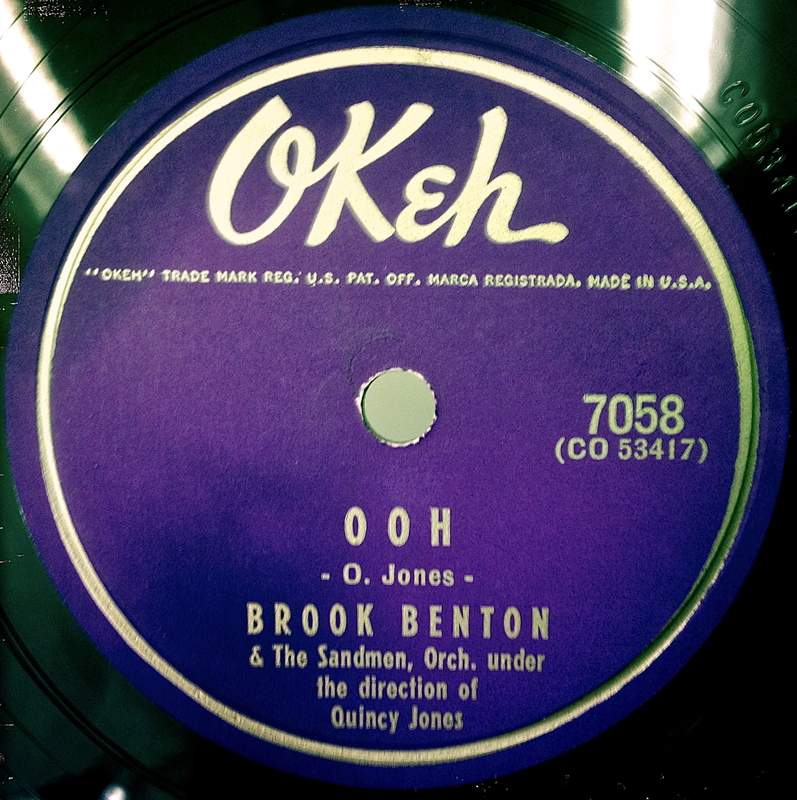 78: “Ooh” b/w “The Kentuckian Song” by Brook Benton. Okeh 7058. Recorded in New York City, 5/26/55 and 6/2/55. Brook Benton was born in rural South Carolina in 1931. His father was a respected chorale director, and Brook—or rather, at this point in his life, Benjamin Franklin Peay—got his start sing Gospel music. His first excursion to New York City, in 1948, saw him working with groups like The Jerusalem Stars and The Golden Gate Quartet, but to little success. He returned to South Carolina, where he joined a secular singing group called The Sandmen, a group which included former Ink Spot Adriel McDonald. The group gave New York City another shot, and they were signed to Epic Records, though they were soon transferred to Okeh. Both labels were owned by Columbia Records, and the switch to Okeh—which was best known for R&B and Country records—indicates a lack of faith in the group’s pop appeal. Still, In 1955, when the Sandmen’s first records were recorded, a lack of pop appeal should have been taken as a compliment. The film song is a touch maudlin to my ears, but “Ooh” is a smooth shot of mid-tempo fun. Brook’s voice is front and center in the mix, and the arrangement of the song is steady and deceptively simple, thanks to a 23 year-old Quincy Jones, who had arranged Big Maybelle’s original version of “Whole Lotta Shakin’ Goin’ On” just three months before. 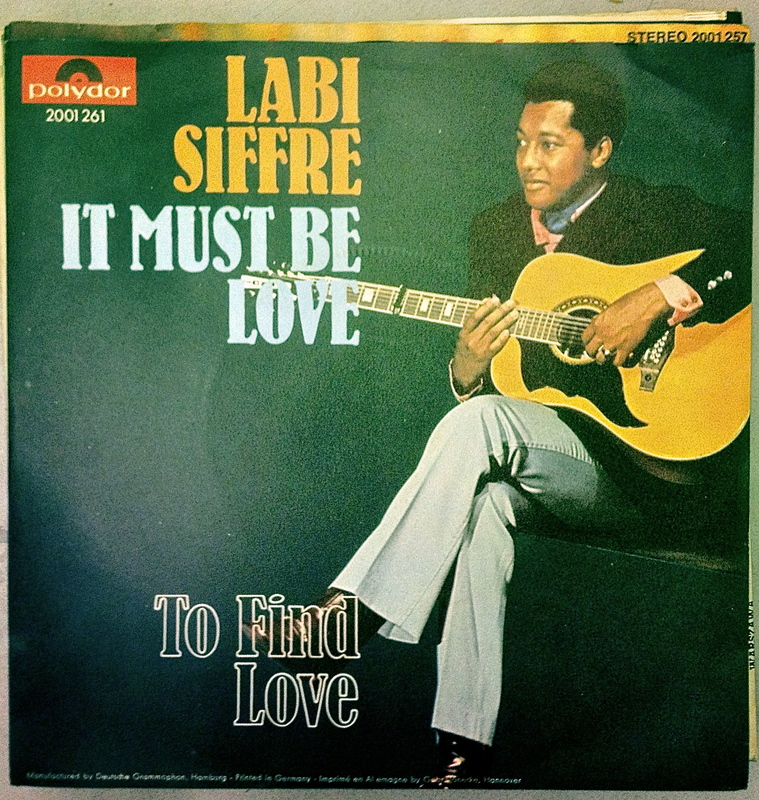 45: “It Must Be Love” b/w “To Find Love” by Labi Siffre. Polydor 2001 261. Recorded in London, 1971. Labi Siffre was born in 1945 in London to a Nigerian father and a Barbadian-Belgian mother. He grew up on Jazz and Blues records, particularly the work of Jimmy Reed, Wes Montgomery, Mel Tormé. By 1970, after having played guitar in small groups all over Europe, Siffre was recording his first solo album, which saw him going in a more acoustic, folk music direction. “It Must Be Love “ is from his second album, 1971’s The Singer and the Song.